The Grants team, within the centralized department of Research Operations, is a vital resource for the research endeavors at CHLA by providing support and guidance to investigators and staff within the research community through the review, approval and submittal of all proposals as well as acceptance of awards for sponsored projects. While the Grants team primarily reviews, approves and submits all proposals and accepts awards on behalf of investigators at CHLA, the team also provides assistance in processing amendments and subawards, supports Requests for Advance Spending (RAS) and Just-In-Time (JIT) information requests, and helps with progress report reviews and submissions. Additionally, the Grants team is responsible for interpreting and advising on sponsor guidelines, applicable federal, state and local laws and regulations as well as CHLA policy and procedures. The Grants team actively supports new and active investigators. For investigators in the pre-proposal preparation stage, please see below for helpful resources, links to funding opportunities and definitions. Investigators are also advised to work with their divisional administration during pre-proposal preparation. For CHLA Investigators with no divisional or departmental administrative support, the Research Services team in Research Operations is ready to support and can be contacted at researchservices@chla.usc.edu. A member of the Grants team is here and ready to help both seasoned and new investigators with proposal review and submission. Early contact to a member of the Grants team is advised to ensure appropriate time to review the agency funding announcement and to ensure each proposal is in optimal position to be submitted by the deadline. At minimum, and in accordance with ADM 242 - Research Agreements, Applications and Proposals for Extramural/Sponsored Project Funds, the financial and administrative portions of the application should be submitted to the Grants team at least five (5) working days prior to the submission deadline. Funding opportunities for all other federal sponsor agencies can be found here. NIH Career Development ("K") Awards provide support for individuals who have demonstrated independent research accomplishments and need additional experience to establish or sustain an independent research program. Career Development Awards may be mentored or non-mentored. Individual mentored K awards (K01, K07-developmental, K08, K22, K23, K25, K99/R00) provide support for a sustained period of "protected time" (generally three, four, or five years) for intensive research career development under the guidance of an experienced mentor or sponsor in the biomedical, behavioral, or clinical sciences. Independent (non-mentored) K awards (K02, K05, K07-leadership, K24) provide protected time for scientists who demonstrate the need for a period of intensive research focus as a means of enhancing their research careers. Independent K awards are intended to foster the development of outstanding scientists and to enable them to expand their potential to make significant contributions to their field of research. In accordance with the NIH Grants Policy Statement, mentored K awardees (K01, K07, K08, K22, K23, K25), as well as individuals mentored through institutional awards (K12, KL2) are required to devote a minimum commitment equivalent of nine (9) calendar person months (75% of their full-time appointment at the applicant institution) which is charged to the K award. Non-mentored K (K02, K05, K07, K24) awardees are allowed to charge effort and salary to federally funded projects as defined by the NIH Grants Policy Statement, 12.3.6.3. Generally, a non-mentored awardee may receive additional salary support from other NIH/PHS grants for effort above that required for the K award and there are no limitations to receiving other salary support. However, K02 recipients may not receive salary from other NIH/PHS grants. To ensure all appropriate salary reimbursements are captured, CHLA will review each K award on its own merits. It is CHLA's responsibility to verify charges to grants are allowable, allocable, and appropriate according the NIH Grants Policy Statement and federal regulations. As with any agency guidelines, the awarding agency may grant exceptions to the policies and guidance provided by NIH. At the time of the just-in-time award, Grants team will work with the K awardee and their mentor to request any necessary changes to the NIH policy. 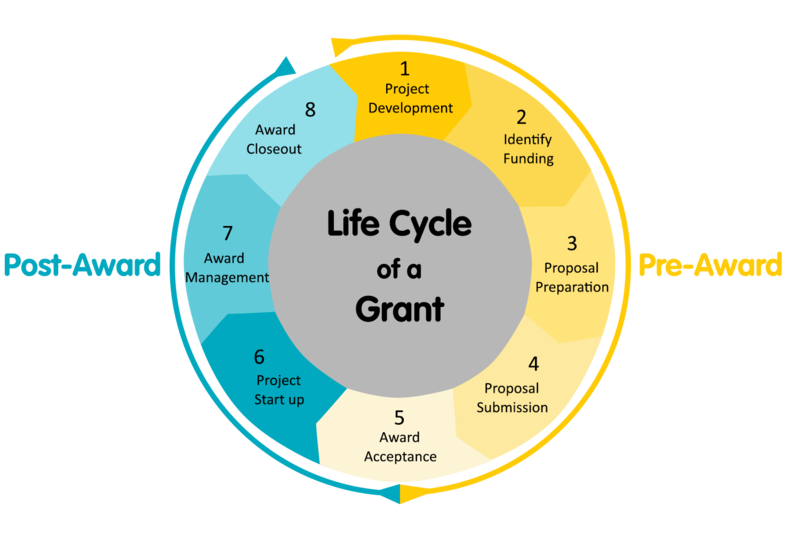 This may include the need to request approval of effort and/or salary on federal peer-reviewed grant when the K awardee is not in the last two years of their project. Both sponsored and donor-funded activities are externally-supported projects, and the classification of funding as "gift" or "sponsored" will affect, among other things, the way CHLA accounts for the funds, assesses F&A (indirect) costs, and reports on the use of the funds to the sponsor or donor. The CHLA Office of Foundation Relations (OFR) can work with PIs to develop and shepherd grants foundation organizations. Once the PI has decided to submit the grant, the CHLA OFR office should be notified. The division analyst will work directly with the OFR on proposal documents as per the agency’s guidelines/announcement. All applications submitted by the OFR must first be reviewed and approved by the Grants team. Grants are sponsored projects that are typically awarded to CHLA in response to a detailed statement of work, usually supported by a project schedule and a line-item budget, both of which are essential to financial accountability. The purpose of a grant is to transfer money or anything of value to a recipient in order to accomplish a public purpose. Grants can support research, training and educational activities, travel, and conferences. Research Operations must review all sponsored projects grant applications and proposal submissions prior to submission to the agency. A gift is an in-kind contribution given to CHLA by a donor with no expectation of benefit other than the hospital expending the contribution for any mutually-agreed upon purposes. Government funds are never treated as gifts. Funding from voluntary health organizations or associations are sponsored projects and not gifts. In remaining cases, when funding is being provided by corporations or foundations, the distinction between gifts and sponsored projects will be made based on the proposal, statement of work, and terms of the agreement, taking into consideration the intent of the donor or sponsor. Sometimes, donors may use the word "grant" and "gift" interchangeably. Limited Submissions are funding opportunities that restrict the number of applications from qualified institutions. Research Operations will post opportunities on this page as they become available. Only one application per institution is allowed. Institutions are also limited to a single SEPA award. Therefore, an institution with an active SEPA project is not eligible to submit an application to this FOA. The Grant Identifications Number is also commonly referred to as Assignment Number, Application Number, or the Award Identification Number, depending on its processing status. The identification number consists of several parts, each having a distinct meaning. The following example highlights each part of the award identification number. For a complete description of Activity Codes, Organizational Codes, and definitions used in extramural programs, see the NIH website. Principal Investigator (PI, also referred to as Program Director or Project Director) - The one individual designated by the applicant organization to direct the project or program to be supported by the grant. The PI is responsible and accountable to the applicant organization officials for the proper conduct of the project or program. Co-Investigator (Collaborator) - An individual involved with the principal investigator in the scientific development or execution of the project. These individuals typically devote a specific percent of effort to the project and are identified as key personnel. The individual(s) may be employed by, or affiliated with, the grantee organization or an organization participating in the project under a consortium or contractual agreement. Consultant - An individual who provides professional or highly technical advice or assistance to the hospital, over which the hospital controls the results but not the manner in which the service is performed. A consultant has measurable effort and is not normally an employee of the organization receiving the services. A consultant may also be a firm or an individual who is an established consultant and the services are provided on the basis of a written agreement for a fee. Key Personnel - In addition to the principal investigator, Key Personnel are defined as individuals who contribute in a substantive, measurable way to the scientific development or execution of the project, whether or not salaries are requested. Typically, these individuals have doctoral or other professional degrees. Other Significant Contributors - This category identifies individuals who have committed to contribute to the scientific development or execution of the project, but are not committing any specified measurable effort to the project. These individuals are typically presented at zero percent effort or as needed. A biosketch, including research support information, will be required for these individuals as this highlights their accomplishments as scientists. However, if an award is to be made, other support information will not be required or accepted for other significant contributors since considerations of overlap do not apply to these individuals. Should the level of involvement change for an individual listed in this category, they should be re-designated as Key Personnel. U.S. Office of Management and Budget (OMB) Circular A-133 and Circular A-81 require awarding entities to determine whether an arrangement resulting from a particular award the awarding entity makes to another organization creates a subrecipient or vendor relationship between the awarding entity and that organization. The OMB defines the terms “vendor” and “subrecipient” and provides guidance for distinguishing between the two relationships. Please refer to the “Subrecipient vs. Vendor” section for detailed information. An entity that expends awards received from a pass-through entity to carry out a project. According to A-133 and A-81, a subrecipient relationship exists when funding from a pass-through entity is provided to perform a portion of the scope of work or objectives of the pass-through entity’s award agreement with the awarding agency. A pass-through entity is an entity that provides an award to a subrecipient to carry out a project. Determine who is eligible to receive financial assistance, and which specific type of federal assistance is to be distributed. Have its performance measured against whether it meets the objectives of the project. Have responsibility for programmatic decision making. Have responsibility for adherence to applicable program requirements. Subrecipients use funds to carry out a project of the organization as compared to providing goods or services for a project of the awarding entity. A vendor is generally a dealer, distributor or other seller that provides, for example, supplies, expendable materials, or data processing services in support of the project activities. A vendor provides generally acquired goods or services related to the support of the prime award. Provide goods and services within normal business operations. Provide similar goods or services to many different entities. Operate in a competitive environment. Provide goods and services that are ancillary to the operation of the project. A Vendor is not subject to compliance requirements of the project. Please also refer to this checklist, developed by the Federal Demonstration Partnership Subcontracts Committee, to help determine when an entity is a subrecipient or a vendor. In order to best support the research community at CHLA, please find below helpful resources, definitions and descriptions to aid in the proposal process. Please note that Research Operations, as the office of CHLA’s institutional signing official, has the responsibility and oversight to review all grant applications to ensure financial and administrative portions of all proposals meet hospital and sponsoring agency guidelines. Per CHLA policy, grant applications must be received by the Grants team at least five (5) working days prior to the funder’s deadline. Principal investigators should confer with their divisional administration team far in advance to ensure proposals are in optimum form before submitting to the Grants team in Research Operations. Funding from awards must be expended in accordance with governing regulations and agency policy. Pre-award reviews budgets to determine costs are allowable, allocable, and appropriate to grants in accordance with the Office of Management and Budget (OMB) Circular A-81, the agency’s policies and guidelines, and institutional policy. Costs must be given consistent treatment through application of those generally accepted accounting principles (GAAP) appropriate to the circumstances. All costs incurred on a grant must conform to any limitations or exclusions in 2 CFR 200 or the sponsored agreement. PIs should work with their division administrators to develop a budget which ensures all costs in the budget are fair and reasonable for a research project in accordance with federal regulations, as applicable, agency policies and guidelines and institutional policy. A budget template for NIH budget preparation is available. CHLA seeks to support its faculty in the pursuit of their research interests while, at the same time, allocating all available resources to comprehensive support of the whole enterprise. Cost sharing, as defined below, may be requested by the grantor in the form of funds or other hospital resources that would be contributed or allocated to a sponsored project over and above the support provided by the grantor. This commitment made by CHLA creates the requirement to track cost sharing in accordance with ADM-57.0 – Cost Sharing/Cost Matching. CHLA actively discourages voluntary cost sharing on the part of principal investigators; exceptions may occasionally be made if the project in question is deemed by the Vice President, Research Operations to warrant a voluntary commitment. All exceptions must be approved prior to submission of the grant proposal by the Vice President, Research Operations. Reach out to TSRpreaward@chla.usc.edu to get an IDC/Cost Share form. This section refers to preparing a budget for the National Institutes of Health (NIH). Additional resources are located on the NIH website. Personnel costs often comprise 65-80% of total funds requested. All personnel with effort on project must be listed by name, and all personnel paid on a project must be CHLA faculty. Refer to the Funding Opportunity Announcement (FOA) to determine whether indirect costs (IDC or F&A) are allowable. The FOA will also delineate whether there is a cap on the indirect cost rate. If there are no mandatory restrictions to IDC, use the applicable rate per CHLA’s IDC Policy. Any voluntary exceptions to the IDC rate will require an IDC wavier, which should detail the amount of indirect to be waived, and must be approved at proposal time by the division head, division administrator, and Research Operations. Certain cost items are not allowed to be charged to federally sponsored projects. Also, items factored into the indirect costs that may not be included in the direct costs of a project. To determine whether a cost item is allowable, refer to federal regulations, the agency’s polices and guidelines or program announcement, and CHLA policy. NIH Grants Policy Statement Section 7.9 details the allowability of costs on NIH grants. All proposals must be submitted to Research Operations at least five (5) working days prior to submission for review and approval. Proposal packages including a completed Intake Form, the application or RFP guidelines/instructions and any other applicable approvals (indirect cost waivers, cost share requests) should be sent to Research Operations at least five days before agency deadline to allow for thorough and appropriate review. Additionally, since cost sharing of indirect cost waiver requests impact budget preparation, these documents should be submitted to Research Operations 10 days prior to an agency deadline. Proposals submitted less than five (5) working days prior to the sponsor deadline will be reviewed in the order in which they were received. While the Grants team within Research Operations, as the office of CHLA’s institutional signing official, has the responsibility and oversight to review all applications to ensure the financial and administrative portions of any proposal meet hospital and agency guidelines, the Office of Foundation Relations (OFR) within the Foundation at Children’s Hospital Los Angeles can work with study teams to help develop strong, competitive applications and shepherd an application to certain philanthropic funding organizations. 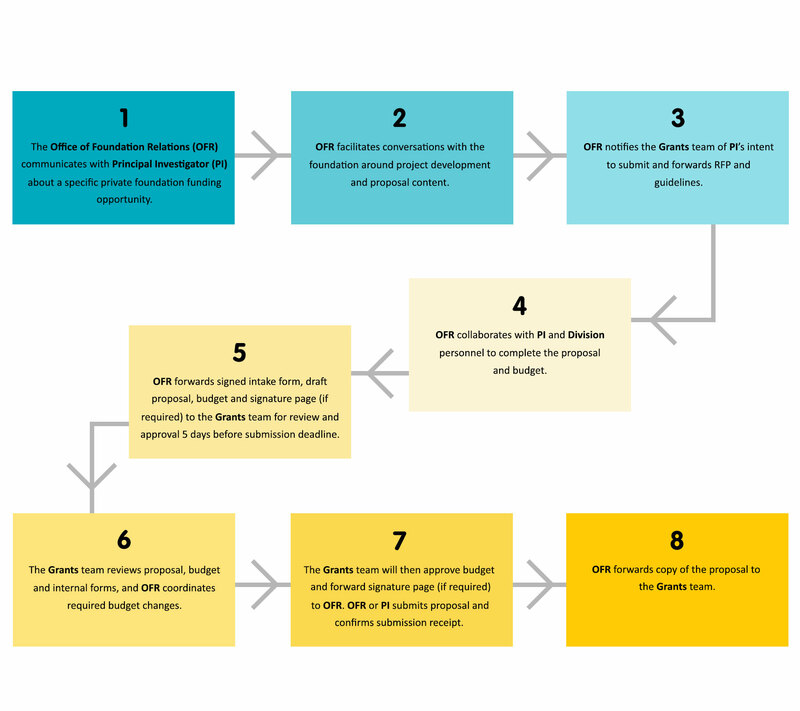 The ORF has developed strong relationships with program staff within a select list of professionally managed philanthropic organizations and is a great resource for investigators seeking foundation grants. The Grants team can connect interested investigators with the OFR upon request. To understand the workflow of Foundation Grant Submissions when collaborating with the Office of Foundation Relations, see below. All proposal submissions seeking external support for research and other sponsored projects must be submitted to the Grants team for review and approval prior to submission. In some cases a sponsoring agency does not require a formal proposal prior to issuing an award. However, even when institutional sign-off is not required by the sponsor, the proposal must still be routed to the Grants for review and approval. Exceptions to this policy may include intramural awards. Submitting a proposal application late or after-the-fact (ATF) will not circumvent a full review by the Grants team. Proposals submitted without Grants team approval may be administratively withdrawn if the submission is found to be non-compliant with CHLA policy or agency requirements. CHLA always reserves the right to request modification rejection of an award received when there is no approved proposal on file with Research Operations. The Just-In-Time (JIT) feature of the eRA Commons is available for applications that meet established criteria and fall within a certain percentile or priority scoring range. The JIT feature allows an authorized signing official (ASO) to electronically submit additional grant application information when requested by the grantor agency. The additional information is requested after a peer review of a grant application has been completed and prior to funding. Requests may come in the form of eRA-system generated e-mails or contact made directly from the awarding agency via e-mail and/or phone. The PI/division is responsible for the initiation of the JIT submission by uploading the requested documents to the Commons and notifying the Grants team via email that the documents are ready for review and submission. JIT information should only be submitted when formally requested by NIH. Documents uploaded into the Commons without proper notification will not be processed. When uploads are complete, click Save at the bottom of the screen and select View Just-In-Time Report. Verify and print the report to keep with departmental records. Once upload is complete contact the Grants team analyst. After proper review, the analyst will submit the information electronically. Once submitted, the Commons will send an e-mail confirmation to the PI and Grants analyst. In some instances, it is not possible to submit JIT materials using the eRA Commons, or the PI will receive specific instructions indicating to submit the JIT materials via email. To submit JIT materials not being submitted using the eRA Commons, send an e-mail to Pre Award with the following information in the subject line: JIT, application number, PI name, and agency due date. Attach one PDF file with documents arranged in the order expressed by the NIH official: Human Subjects (IRB) or Animal (IACUC) approval(s), whichever is applicable, training certifications, and/or any other supporting documentation should be included. Also include in the body of the email to Grants any additional narratives providing status, justification or explanation requested by the sponsor. If submitting a cover letter signed by the PI, forward the PDF and the initial agency request that contains instructions and due date for submission. When a delay in receiving an award is expected, or on a federal award which allows pre-award spending, Advanced Spending allows expenditures to be charged to the correct project and therefore limits cost transfers and retroactive personnel actions. The allowability of pre-award costs must be taken into consideration. All standard award documentation requirements, including assurances, must be complete prior to setting up an advanced spending account. NOTE: Divisions requesting advanced spending do so at their own risk. If funding for the project does not materialize, or is less than expended, incurred expenses will be transferred to an eligible division account. To request Advanced Spending, please complete the Request for Advance Spending(RAS) form and have it approved by all divisional applicable parties. Submit the signed RAS form to the Grants team and allow five (5) business days to complete the majority of requests. Large projects or projects with uncommon costs may require more review time. All requests will be reviewed in the order received and in accordance with major proposal deadlines. Upon notification to the Grants team and Principal Investigator that a proposal is awarded for funding, a member of the Grants team will process the acceptance of the award and work with the investigator on next steps. Following the start of the project, the Grants team will also support investigators with Progress Reports and any changes to the project scope, details of which are below. As a component of the reporting process to the sponsoring agency, progress reports are typically required for all awards. The reporting requirements for an agency are generally listed in the program announcement, the agency’s polices and guidelines, notice of grant award, or sponsored research agreement. The Grants team must review and approve all progress reports prior to submitting to the agency. Progress reports usually are required annually as part of the non-competing continuation award process. NIH may require these reports more frequently. Refer to the notice of award (NOGA or NOA) for reporting requirements. The “Non-Competing Continuation Progress Report” (PHS 2590) or equivalent documentation (e.g., Research Performance Progress Report [RPPR]) must be submitted to, and approved by, NIH to non-competitively fund each additional budget period within a previously approved project period (competitive segment). Except for awards subject to Streamlined Non-Competing Award Process (SNAP), the progress report includes an updated budget in addition to other required information. The RPPR is a federal wide format for the submission of required annual or other interim performance reporting on grant and cooperative agreement awards. NIH now requires use of the RPPR module in eRA Commons to submit all annual progress reports. NIH continues development of the RPPR for final progress reports and for administrative extensions (Type 4s; e.g., SBIR/STTR Fast-Track Phase II application) and will update the community as progress is made. Streamlined Non-Competing Award Process (SNAP) RPPRs are due approximately 45 days before the next grant year budget period start date. Non-SNAP RPPRs are due approximately 60 days before the next grant year budget period start date. Multi-year funded (MYF) RPPRs are due annually on or before the anniversary of the budget/project period start date of the award. The exact start date for a specific award may be found in grants status in eRA Commons. A report of all progress reports due for an organization is available at here (CHLA’s IPF Number is 1520001). 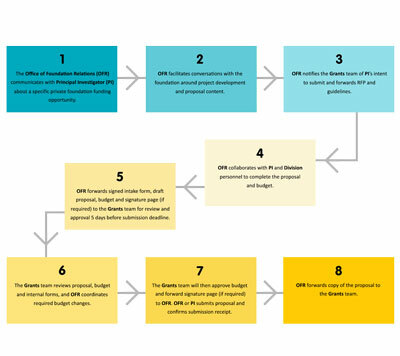 Route the completed RPPR to the Grants analyst by selecting an Authorized Signing Official. Use the validation button in the RPPR application to ensure there are no errors in the application prior to submitting it to Grants. Almost without exception, a change in scope of work requires a prior approval from the sponsoring agency. In general, the Principal Director (PD)/Principal Investigator (PI) may make changes in the methodology, approach, or other aspects of the project objectives. However, a change in scope almost always requires sponsor approval unless special permission is given within the award agreement. A change in scope is a change in the direction, aims, objectives, purposes, or type of research training, identified in the approved project. All requests for prior approval must be in writing, well-justified, and accompanied by supporting documentation to ensure that changes are reasonable and appropriate. The written requests have to be submitted to Grants to be reviewed and submitted. To obtain sponsor approval, the PI must draft a justification letter on institutional letterhead. The letter must be signed by the division head and forwarded to the assigned Grants analyst. Occasionally, it is necessary to change the Principal Investigator (PI)/Project Director (PD) or key personnel of an awarded grant or contract. This may be the result of a PI withdrawing completely from a project or taking a leave or sabbatical for a continuous period of three (3) months or more. Most federal sponsors require the grantee to notify them prior to any changes with the PI or other key personnel named in the notice of award, as well as approval of any alternate arrangement to the PI or other key personnel proposed by the grantee before such changes can be implemented. Divisions should refer to the terms and conditions of the award to determine if the sponsor will allow the award to be retained in the absence of the original PI. Generally, sponsors reserve the right to terminate a grant if approval for a leave of absence has not been sought or if the replacement PD/PI or key personnel is not acceptable. When the sponsor requires prior approval, such requests should be sent in writing to the Grants team for review and approval before they are submitted to the sponsor. Contact your Grants analyst for assistance. To request a change in PI/PD, the current PI or division must initiate the request and route it to the Grants team. Submit this letter, plus a Research Conflict of Interest Certification form for the new PI, to the Grants team. Upon receipt of the letter, Grants will submit the request to the sponsor in accordance with their guidelines. Upon sponsor approval for change of PI, Grants will notify all of the appropriate business officials of the change and make necessary updates to all data systems and files.